You expect at the Drupa trade show, currently running at Düsseldorf, a certain amount of showmanship. Demos with lots of loud music, Xerox has Ministry of Sound shows 3 times a day, and the show everyone wants to hear is of course from Benny Landa about Nanography. But tucked away at the end of Hall 8a is a prototype machine easily missed. Not just the machine but the significance of it too. The machine is the Canon Voyager, demonstrated every hour with the usual display of print samples under glass close by. Canon is not really keeping it quiet, it is a public display and they have a page advertisement for it in every issue of the Drupa Daily. But that’s pretty modest compared to others. So what’s so special about it? Well, at Drupa 2012 Landa Digital showed their presses for the first time. Instead of ink jetting the image directly onto the substrate, they printed onto a flexible belt, dried the image, and then transferred the image to the substrate. The advantage of using intermediate transfer is that the process becomes almost substrate independent, one of the concerns of direct printing. Of course there is a major problem to be overcome, as you need the intermediate transfer surface to be non-wetting at the transfer stage, yet wetting when you jet the image. I track all of the ink jet patent applications published, and can tell you that Canon probably has the most relating to intermediate transfer, with others with IP in this area such as Xerox, Ricoh, Seiko Epson and Fuji Xerox. By now you should have worked out that the significance of the Canon Voyager is that it also uses liquid intermediate transfer, this time using a drum rather than a belt. It’s a B2+ press capable of 3,000 sheets per hour. New fixed array bubble jet printheads print 7 colours using pigment-based inks onto a drum covered with the intermediate transfer blanket. The image is then dried and transferred to the final substrate. Little information has been given about Canon’s intentions for the press. 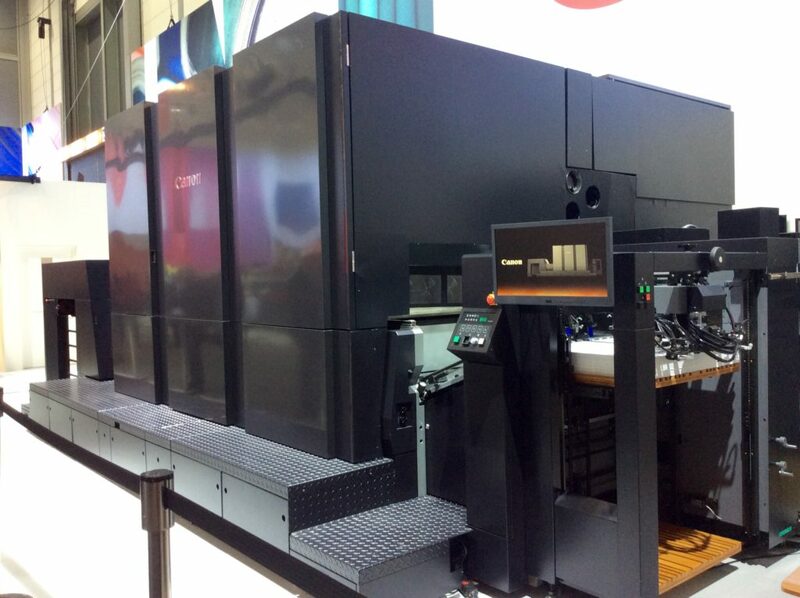 It is planned for a launch in 2018 and will be aimed at high-end commercial printing applications demanding the highest print quality. Canon already has experience of producing high quality from fixed ink jet arrays in the DreamLabo photofinishing machine, although in that case printing is directly onto coated photo paper. So with a confident Landa Digital announcing the building of factories ready for volume production of the Nanographic presses, and now Canon also planning intermediate transfer, what will we see in 3 years time at Drupa 2019. My prediction is we will see ink jet presses, both direct and intermediate transfer, vying side by side for customers. If anyone thinks ink jet is close to the limits yet they are wrong.